Grandma Kathy’s Homemade Turtle Candy ~ this vintage recipe is straight from grandma’s recipe box, it’s the one she made throughout the 60s, 70s, and 80s and it’s still the best classic holiday candy around. This beloved candy is easier and quicker to make than most, but involves just enough labor to make it special. When I was growing up all the neighborhood moms would try to outdo each other with their holiday cookie collections. They arranged them in neat little compartments in what seemed to be, at least in my memory, HUGE boxes that made all the kids’ eyes bug out. Each mom had their own signature assortment of goodies, but everyone included turtles. Each one of my weighty turtle is a handful and will keep anybody happy for a while. Give a small box of these as a host or holiday gift and you will be very popular, I promise. Turtles are a nostalgic candy, invented at the turn of the last century. They’re made from caramel and pecans layered together and coated with chocolate. You don’t need a mold, or any special equipment to make turtles, just a microwave, a baking sheet, and a silicone mat or parchment paper for a non-stick surface to work on. 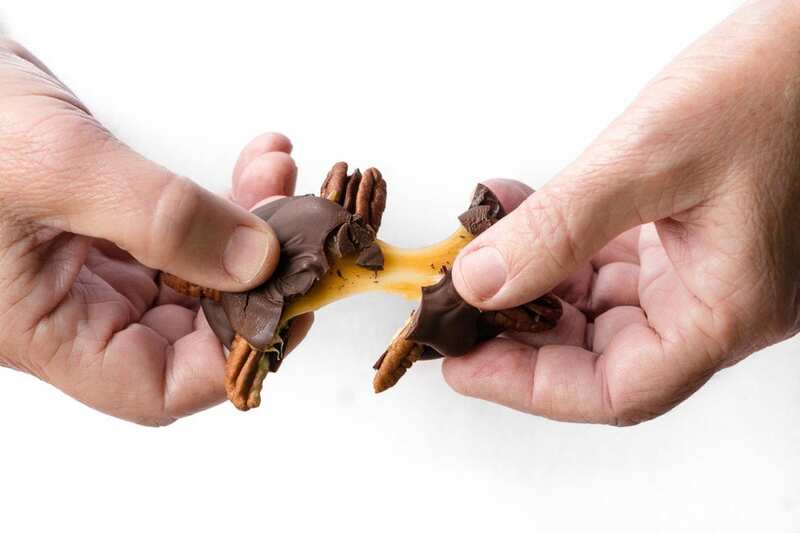 The trick to making blue ribbon turtle candy is simple: first toast the pecans for 10 minutes in a 350F oven. That’s it. This not only makes the nuts super crisp, it intensifies their flavor. Raw pecans are virtually flavorless compared to roasted nuts, so your turtles will have a big leg up on the competition from the get go! The toasted pecans paired with dark chocolate make a very rich and sophisticated flavor profile in this candy. Definitely gift-worthy. There are lots of ways to construct a turtle, but I think I’ve found the best way. It starts with a dollop of melted chocolate which provides a sturdy base for the candy. Then the pecan ‘legs’ go on, topped with caramel. Then another layer of chocolate seals it all together. Again, put the tray in the freezer for 5 minutes. 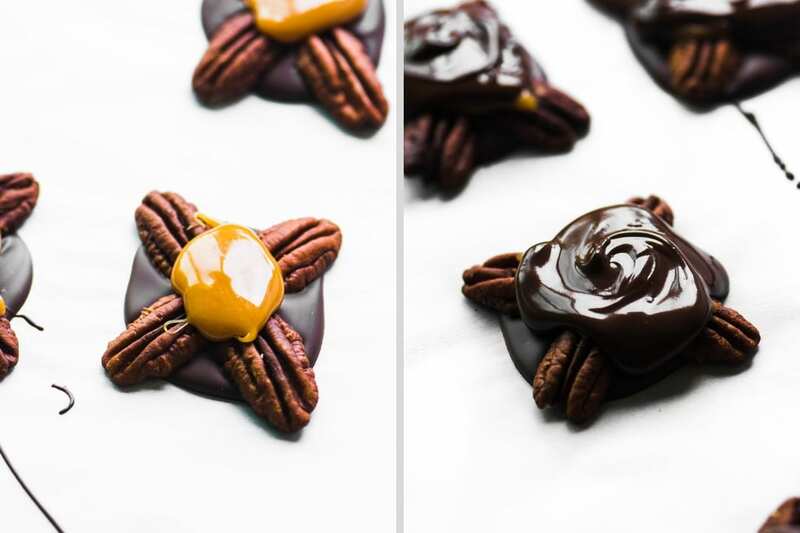 Melt the remaining chocolate and add a small amount to the top of each turtle, spreading it around to cover the caramel. I like to give the chocolate a little swirl flourish as I lift up my spoon. Put the tray in the freezer for 5 minutes. Garnish with crushed pecans or sea salt while the final chocolate topping is still wet. 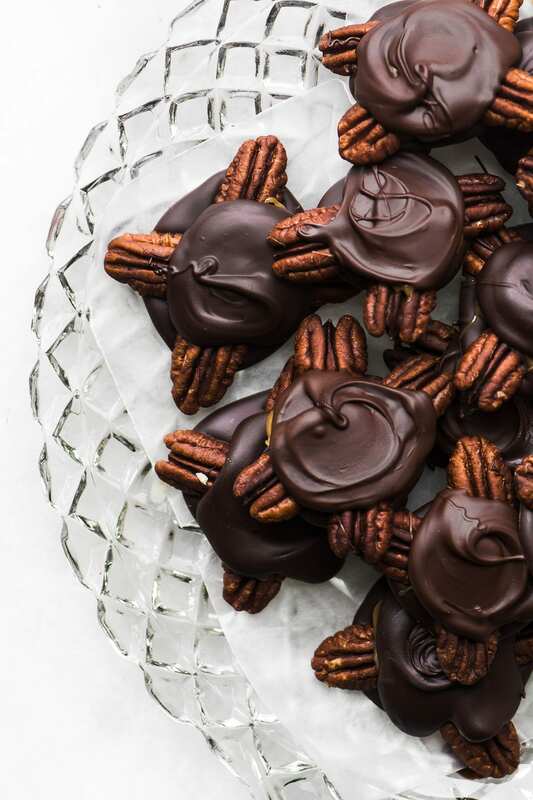 Use your favorite spiced pecans for a unique touch. So easy to make and so good! i used Ghirardelli chocolate. Thanks for the recipe! Love to see these appear on your side. One of my American exchange students made these for us at Christmas and they were a big hit. He had the caramels send from the US however so I would have to make my own instead. December is just such a crazy busy time and even more so in Denmark. We have so many traditions and lovely little things we do all month. Among other things we celebrate Lucia, and we celebrate 1 of December (where the “nisse” moves in (kind of an elf but different and have a history of a least a 1000 years as a magic creature living on the old farms. Today they have their own tiny doors in many homes with kids), we also celebrate all four advent Sunday’s (with a special advent wreath). Do you have special national traditions in Canada? Oh I always been sure you where in Canada. Sorry. I lived in New York (for my Master degree) so I know American traditions better. We have lots of traditionel Christmas cookies. The oldest being “kleiner” because you could make them without an oven (they go back to around 1500). “Brunkager” do require an oven but are very old to (around 1700) while “jødekager” is from around the late 1700. Among other very popular and old are “vaniljekranse” and “pebernødder”. They are all good. As to what to choose it depends. Vaniljekranse is the ones you can find in the Danish butter cookie collection (but the ones in these tins are considered bland in Denmark. The real ones are made with almonds and real vanilla). All the rest will be new for your American readers. “Brunkager” and “kleiner”” is less of a hit with my American students than the rest. 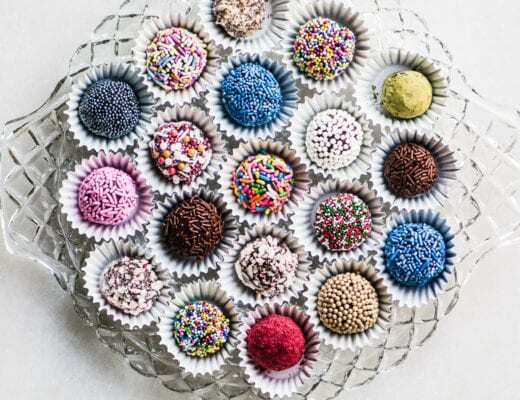 “Pebernødder” are easy and cute and you will find them everywhere in Denmark in December (literately: in little trays in all shops, at all social gatherings, Santa’s and ““Nisser” will be carrying them and all kids will bake them). They are one of few things you can buy a finished spice mixture for but you can easily find the spices separately. I can point you in a direction for a good recipe if you choose one of these. These turtle candies look so inviting! I need to get some pecans to make this too. 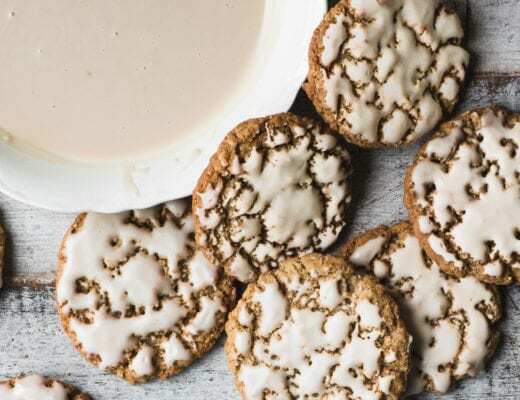 You have definitely made grandma proud with this recipe. I love how few ingredients there are, and even better is how beautiful they are! A bit of extra chocolate is NEVER A BAD THING. 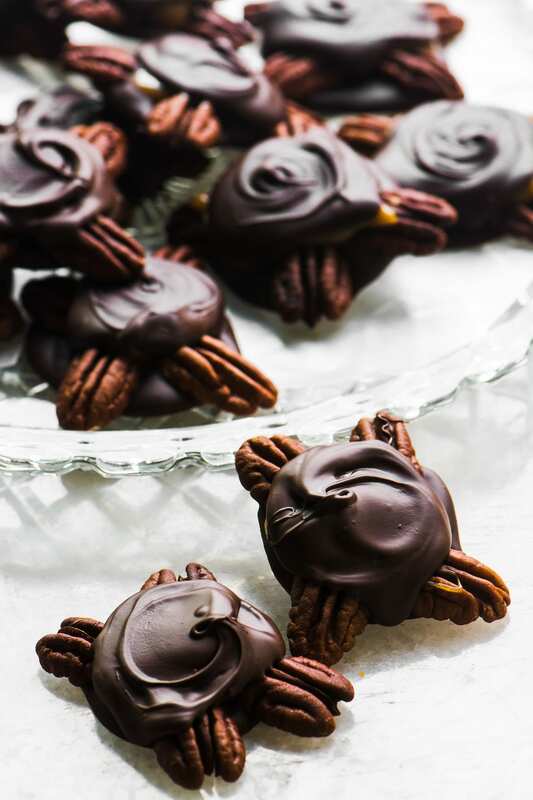 My husband absolutely loves turtle candy — maybe I’ll surprise him with a batch this weekend. I know he’d go nuts for it! 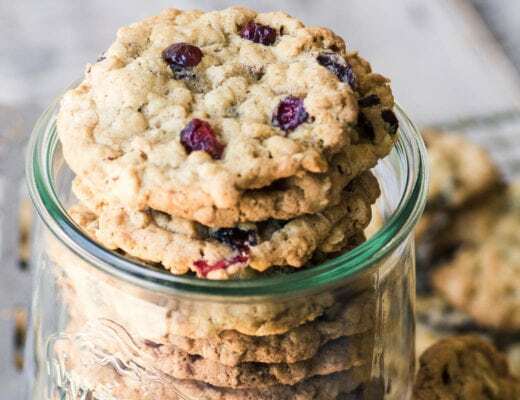 The best recipes come from Grandmas recipe box! What a delicious classic and one that will never go out of style! I agree! I love to raid people’s recipe boxes, they’re like little treasure troves. So cute! And perfect for serving on a Christmas cookie tray! Love this recipe! It’s always the first thing to be grabbed! Thank you for sharing this family recipe! These turtles are absolutely adorable and would make a fantastic holiday gift!